Learning at the Warasa Drum SchoolOver the past seven years The Battle of the Drums has become an integral part of the Garifuna celebrations that culminate with Yurumein, the reenactment of the arrival of the Garifuna on the shores of Belize on 19 November. On the evening of Friday 16 November the Battle of the Drums “Food & Fete” brings people together from all walks of life to socialize, network and enjoy an evening of good food and great Garifuna music. It will showcase Garifuna Cuisine fused with contemporary cooking styles, dishes and menus prepared by chefs from the Radisson Fort George in Belize City, Laru Beya in Placencia and Belcampo Lodge of Punta Gorda. It will also feature local and national Garifuna musical performers performing great paranda and other Garifuna music. Performers will include Paul Nabor, Mario and the Umalali Group, Godfrey Sho and the Culture Dynamics and Lascelle Martinez and the PG Vibes. The Battle of the Drums Competition on Saturday 17 November is a drumming competition and show that allows groups to compete and display their musical artistry in playing five different categories of Garifuna drumming. The first Battle of the Drums was held in Punta Gorda Town on November 17, 2006 and was well received by spectators from home and abroad. In 2007, there was even a bigger audience and greater enthusiasm. In 2008 the event evolved into an international drumming competition and show involving drumming groups from various parts of Belize as well as from neighbouring Guatemala and Honduras. The Yurumein Ceremony takes place at 06:30. at the Punta Gorda Cooperative wharf area and presents a dramatization that depicts the first arrival of the Garinagu to the shores of Belize. After the re‐enactment ceremony there is a parade through the principal streets of Punta Gorda Town followed by a church service. 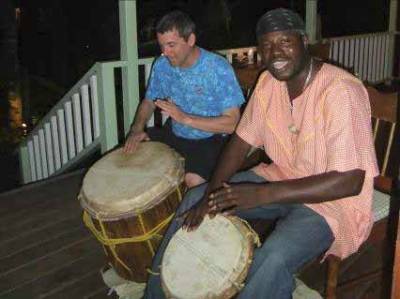 Drumming is just one of the tangible elements of the Garifuna culture, and the local Warasa Drum school is aptly named – “warasa” meaning “our culture” in the Garifuna language. Warasa Drum School was founded in 2010 by Ronald Raymond McDonald, and his wife, Ruth. Ruth originally hails from Scotland, and she reminisces that a few weeks after they first met Ray shared his dream with her of opening a Garifuna drumming centre – not only to teach drumming, but also how to make drums, and to share the Garifuna culture with others. With both of them working and saving hard to build their house at the Garifuna reserve they struggled to see how this vision could become a reality but, deciding they had to start somewhere, spent a weekend designing a sign, putting paint to plywood, and erecting the finished product outside their rented house. The sign did its job, piquing interest, and Ray began teaching four local children. He was also engaged by a PG guesthouse to provide weekly drumming lessons for their guests, and interest quickly spread to include performances and lessons at a number of lodges throughout the District. Ray is an engaging character and a very patient and skilled teacher. Being fiercely proud of the Garifuna culture, lessons are filled with anecdotes which provide extra insight into the Garifuna culture – a culture which was little known outside of the region until recently, but one which is now recognized by UNESCO as a “masterpiece of the oral and intangible heritage of humanity”. Ray claims that he can teach even the most non‐musical to master at least one of the six traditional Garifuna rhythms, and I was curious as to whether he lived up to his reputation. I wondered how I would fare at my first lesson (especially being ‘kackhanded’ which had previously led to some interesting experiments with stringed instruments), but Ray broke down the simplest Paranda rhythm into easy stages – the heavy beat from the lead hand, interspersed with a half beat. Within a few minutes we were rocking – my providing the lead beat on the larger segunda drum, with Ray dazzling us with complex rhythms on his smaller primero drum, hands moving seemingly at the speed of light, before breaking into song in his rich, mellow voice. Although my technique could have done with quite some improvement, we then moved on to the Gunjei rhythm. Oh my, not only was a lot more beating involved, but suddenly your hands need to move position on the drum. It looked amazingly complex but, again, Ray broke it down into small parts and a few minutes later the “one two‐and three‐and four‐and” (coupled with a back and forth from the centre to the edge of the drum) was starting to become more fluid. The drums themselves are a labour of love, hollowed out from cedar, mahogany or yemeri logs, topped with deer skin held in place by vines, and a wire or string snare to intensify the sound. (Note to ladies: you should dress suitably so as to preserve your modesty – a large drum and short skirt can make for some pretty revealing photographs, so short or long pants are a good idea). Each Garifuna rhythm is usually accompanied by a different style of singing and dancing, with the Punta probably being the most popular style in Belize, and as close to a national dance as you can get. Visitors are often mystified how Belizeans are seemingly able to move their butts independently of their body, and there’s a widespread myth that Belizeans have developed special muscles. Ray disputes that, and also teaches Garifuna Dance – the secret, he says, is all in shifting your knees! Ruth agrees, and she has now mastered both the Punta and Paranda dance, but I decided to leave those lessons for another day. Warasa has grown from strength to strength, and they are helping to raise awareness of Toledo and our rich cultural heritage. The Warasa Drum School can be found at the Garifuna Reserve on New Road, around a 10 minute walk from the airstrip in PG Town. Note: This article first appeared in the October 2012 issue of The Toledo Howler - reproduced by permission.